Inspections can be executed in our factory and on customers location, as well running as not running. After every inspection we offer You an clear inspection report, based on facts, with conclusions and advises. If the gearbox must be dismantled, since severe damage is present, the entire gearbox will be thoroughly visually inspected. We also conduct a NDO study on the gears. To prevent a dismantling of the gearbox, we can perform an inspection by video scopy. To inspect rolling element bearings and gears, we use the latest videoscopes from General Electric. These videoscopes allow us to identify problems, often impossible to see by the naked eye. 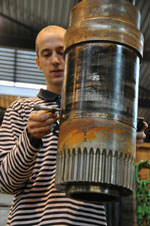 Before dismantling the gearbox we check al the contact paterns. When decided that the gearbox should be overhauled, all dimensions of all parts are checked and judged with our latest experience and engineering rules. We allways want to know the cause of damage. If this is not clear, we will recalculate the gearbox on strength. We therefore have for example the well known software "KissSoft". It's allways necessary for us to understand the reason for collapsing, because we are offering You 6 months guarantee. Second to rotor unbalance, misalignment is a frequently encountered problem. GBS is able to handle both hot and cold alignment projects on your machinery as well as reciprocating compressors in addition to rotating machinery. Our services are available from simple two case machine configurations to more complex multi-case situations such as large steam turbine generators. Our knowledge, experience and equipment allows us to identify potential machinery malfunctions, such as rolling element bearing defects, gear related problems, rubs, resonances, etc. Significant and valuable time can therefore be saved to resolve the problem.